When exposed to ultraviolet light, perchlorates, the class of chemical compounds on Mars’ surface, turn deadly for bacteria. “We report the significant bacteriocidal effects of UV-irradiated perchlorate on life at ambient temperatures and under Martian conditions,” the study’s authors write. The discovery suggests that life-seeking missions to Mars will have to dig layers deep to possibly uncover signs of past or present alien life. Signs of life are more likely to be found two or three meters beneath the planet’s surface, in an environment that’s protected from intense radiation, The Guardian reports. “At those depths, it’s possible Martian life may survive,” Jennifer Wadsworth, a postgraduate astrobiologist at Edinburgh University and co-author of the study said. 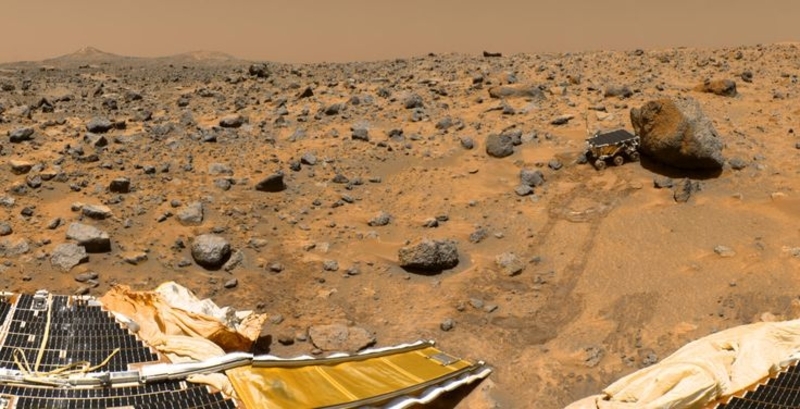 Perchlorates were first discovered in Martian soil by Nasa’s 40-year-old Viking lander missions. More recent missions have confirmed their presence. Wadsworth and astrobiologist Charles Cockell found that when perchlorates are exposed to ultraviolet light, they kill bacteria twice as fast as UV light alone.